Stopped off at the Roxi this afternoon and tried a Belgoo Magus. On the marketing side, Belgoo is a pretty slick mix of new and old. The logo is modern, but at the same time, they’re really pushing the “all natural” angle of wholesome and traditional brewing. 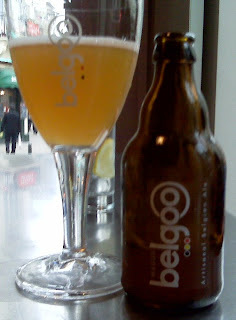 From Binche in Walonia, Belgoo Magus is a four-grain beer, using barley malt, wheat malt, oats and spelt, as well as Saaz hops. Like many Belgian ales, it’s alive in the bottle, with the yeast working on the product even after it leaves the brewery. Taste-wise, it seems to me a pretty standard Belgian strong blonde ale. Cloudy and creamy, with powerful hop and yeast flavours, some citrus for sure. 6.6% alcohol by volume. Belgoo Magus is a good representative of the genre but nothing exceptional -- apart from the nifty logo, of course.